As more postdoctoral researchers and Ph.D. candidates make the rounds of universities in the market for new faculty in computer science, computer engineering or bioinformatics, another CSE soon-to-be-graduate is headed to teach and do research in computer science at Johns Hopkins University. It appears that Johns Hopkins found in Huang someone who could help build a new area of strength for its Computer Science department. His research area is computer systems. 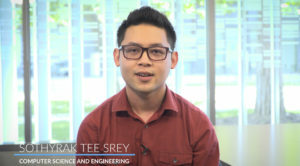 “I’m particularly interested in understanding growing problems in real-world systems and reflecting that understanding in new techniques to improve system reliability,” said Huang, whose advisor is CSE Prof. Yuanyuan (YY) Zhou. Huang did a few other interviews after Johns Hopkins and got a second offer to compare what Hopkins was offering, then canceled other interviews and accepted the job in Baltimore. He says the university is investing in the area of computer systems, so his research is closely aligned with Johns Hopkins’ hiring priorities. Huang is also getting ready for a trip to Singapore later this month, where he will present a paper at MobiSys ’16 on “DefDroid: Towards a More Defensive Mobile OS Against Disruptive App Behavior.” The paper is on hardening mobile operating systems to better shield users from “naughty” mobile apps that can aggressively drain battery, eat data plans, and so on. Huang also created a one-minute short video pitch for the DefDroid paper. View his video pitch on YouTube at https://youtu.be/lguUoitv80U. The assistant professor-to-be has been at UC San Diego since 2010. 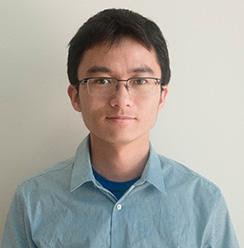 He joined Prof. Zhou in the Systems and Networking group after finishing two undergraduate degrees at Peking University (BS in Computer Science and BA in Economics, both in 2010). ← Alan Turing Memorial Scholarship Awarded to Valeria Gonzalez!